I'm relaunching this blog at http://ethiopianphilosophy.wordpress.com/. Please join me there. In the name of God who alone is just. I shall describe the life, the wisdom and the investigation of Zera Yacob who said: “Come and listen, all you who fear God, while I tell you what he has done for me.” Behold, I begin. In the name of God, who is the creator of all things, the beginning and the end, the possessor of all, the source of all life and of all wisdom, I shall write of some of the things that I have encountered during my long life. Let my soul be blessed in the sight of God and let the meek rejoice. I sought God and he answered me. And now you approach him and he will enlighten you; let not your face be ashamed. Join me in proclaiming the greatness of God and together let us extol his name. I was born in the land of the priests of Aksum. But I am the son of a poor farmer in the district of Aksum; the day of my birth is 25th of Nahasye 1592 AD, the third year of [King] Yacob. By Christian baptism I was named Zera Yacob, but people called me Warqye. When I grew up, my father sent me to school in view of my instruction. And after I had read the Psalms of David my teacher said to my father: “This young son of yours is clever and has the patience to learn; if you send him to a [higher] school, he will be a master and a doctor.” After hearing this, my father sent me to study zemya. But my voice was course and my throat was grating; so my schoolmaster used to laugh at me and tease me. I stayed there for three months, until I overcame my sadness and went to another master who taught me qenye and seweseya. God gave me the talent to learn faster that my companions and this compensated for my previous disappointment; I stayed there four years. During those days, God as it were snatched me from the claws of death: for as I was playing with my friends I fell into a ravine, and I do not know how I was saved except by a miracle from God. After I was saved I measured the depth of the ravine with a long rope and found it to be twenty-five fathoms and one palm [deep]. Thanking God for saving me, I went to the house of my master. After this I left for another school to study the interpretation of the Holy Scriptures. I remained ten years in this type of study; I learned the interpretations both of the Frang and of our own scholars. Oftentimes their interpretations did not agree with my reason; but I withheld my opinion and hid in my heart all the thoughts of my mind. Having returned to my native Aksum, I taught for four years. But this period was not peaceful: for in the XIX year of King Susenyos, while Afwons, a Frang, was Abuna, two years [after his arrival] a great persecution spread all over Ethiopia. The king accepted the faith of the Frang, and from that time on persecuted all those who did not accept it. Ethiopia’s first distinctively philosophical text is also her first autobiography. Zera Yacob describes here his traditional education in poetry, scripture, and hermeneutics; the inquisitive temperament which is hinted at here will be seen in later chapters to develop into a general skepticism about revealed religion, prompted by the sectarian conflict in the Ethiopia of his day. The “Frang” are foreigners. Portuguese soldiers had arrived in Ethiopia in the middle of the 16th century, and effectively saved the ancient Christian highland civilization from the depredations of Ahmed Gragn. The Jesuits hung around, and eventually found influence at court, eventually with the results described here. Comparisons with Descartes are nearly ubiquitous in the (very limited) secondary literature on Zera Yacob, and with some justification. We already see a bright student with doubts about his traditional education; soon we will see Zera Yacob in isolation, tearing down his beliefs and building them back up. I’ll comment on some of the similarities and differences a bit more once more of the text has been set out. Yes, some philosophy was written in Ethiopia. If we hold to reasonably high standards for what is to count as philosophy, then there are two philosophical treatises in Ethiopian history (well, before the 20th century, say), both of them written (in Ge'ez) in the 17th century, one by Zara Yacob and the other by his pupil Walda Hiwet. 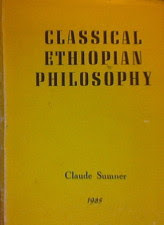 These have been collected and translated, along with some other works of a quasi-philosophical nature, by Claude Sumner, in Classical Ethiopian Philosophy. The works collected in that volume can also be found, along with texts and extended commentary, in Sumner's series of volumes of Ethiopian Philosophy. Practically nothing else beyond encyclopedia articles (which are again mostly by Sumner) has been published on these philosophers, at least in English (and not much in other languages either as far as I know - though probably there's a certain amount of stuff kicking around the halls of Addis Ababa University, whether in English or Amharic or some other language.) Unfortunately these books are rarely available on Amazon either new or used, nor are there even limited previews available on Google Books. There is however a selection from Zera Yacob in an anthology. As for the actual content of these works - well, the idea is to work through them on this blog. I suppose I'll quote from the book along with some comment of my own until I'm confronted with some kind of copyright issue. Finally, and apropos of nothing, there are some really lovely songs on Vienna Teng's new album, Inland Territory. Note: I've relaunched this blog at http://ethiopianphilosophy.wordpress.com/. Please join me there. This is the internet's foremost (alright, only) blog devoted to Ethiopian philosophy. Other topics arise depending on my fancies. The blog is named after philosopher Zera Yacob (1599–1692).